Fate of the Dragon Game Review - Download and Play Free Version! Re-live some of the most savage battles in the history of the world as you go back to 184 AD in this epic war adventure! Three playable leaders for a variety of play. Based on a historical novel, Romance of the Three Kingdoms. Adjustable difficulty so you can play at your skill level. Tutorial to teach you how to play. 'Fog of war' blacks out explored areas if you leave them. "In war then, let your great object be victory, not lengthy campaigns" Sun Tzu, 500 B.C. It is the year 184AD. With the same visciousness of the Mongols still to come, clan war is at a height in China. The Eastern Hun dynasty has collapsed throwing China into chaos. With chaos comes war... lots of war! In Fate of the Dragon, you will be 1 of 3 emerging warlords desiring to re-unite China to gain its former glory. You are not alone in your desire to re-unite China through force. Will this war break your dynasty, or build it? Can you handle attacks from every direction? Will you choose to fight and conquer, or will you trust some of the other clans and dominate through political alliances? These are all questions you'll have to wrestle with in this intense real time strategy epic! You can dabble with battles and be forced into servanthood or follow the advice of Sun Tzu and seek for victory with expedience. Do you have the stomach for an all out assualt? Battle for control of the three kingdoms as you attempt to be the ruler of China. Play as any of the three warlords in this historically based real time strategy (RTS) game based on the novel, Romance of the Three Kingdoms. You will be in command of the armies as you lay wate to enemy palaces using siege ladders to scale the walls and demolish towns. In Fate of the Dragon you will choose between one of three leaders: Liu Bei, Cao Cao or Sun Quan. Taking place in the year 189 AD, your goal is to unite the three kingdoms into one and become the ruler of China. The story is based off the historic novel, Romance of the Three Kingdoms by Luo Guanzhong. The bit of history thrown into this game makes it a very unique RTS game. Having this game set in ancient China is also rare since most RTS games are either medieval or futuristic. Each warlord presents a slightly different story line, but the missions are relatively similar. This game plays like most RTS games but has a few features that differ from others. You can choose to play the campaign where you will choose a warlord and play through all the missions as him. The other option is to play custom games where you set up the map, opponents and difficulty settings. In the campaign mode you will start with a choice of one of the three warlords, each will have their own back story. After you have selected a warlord, you will start with a tutorial that will teach you how to construct buildings, farm food and other resources, and begin building armies. Gathering resources is interesting, you must build a farm or market and have peasants work there to gather (or make) food. When you begin building armies there are plenty of options for what to build. Peasants are trained into the various types of soldiers and are also employed to build the war machines. Things such as catapults and scaling ladders can be used to take over enemy bases. The graphics are nothing spectacular in this game but they don't detract from the game. They don't cause any issues in gameplay and you can still easily distinguish characters and units, but if you are looking for awesome graphics in your RTS game than this might not be for you. The soundtrack is very well done and adds to the feel of being in ancient China. The music is calm and relaxing and the peasants chatter can be heard when you click on them. One problem this game does have, is with the “fog of war”. The fog of war is the blacked out portion of the map you haven't explored yet. In most RTS games once explored the fog turns opaque, allowing you to see the terrain but nothing that is currently happening there unless you have troops there. In Fate of the Dragon the map goes completely black once you leave an area. This forces you to reexplore every area each time you need to go there. The only way to remedy this is to turn the fog of war off, but this takes the mystery out of the game. Fate of the Dragon is a well made RTS game that includes a bit of history. The combination of a unique location and a historical plot line make this a game well worth playing. With the tutorial at the beginning, the game is simple enough for anyone to play. The large number of siege vehicles lets you conquer fortresses in exciting ways such as using ladders to scale the walls. All-in-all this is an excellent game that will keep you entertained for hours. 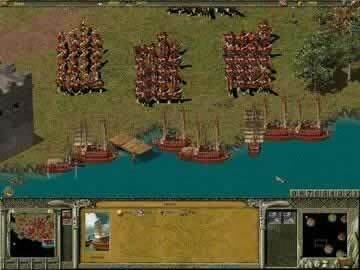 Video showing cinematic sequence in the game.